We observed another fall, family tradition, this afternoon, by making gingerbread men, in celebration of the first, "real snow", of the season. Generally, we roll, cut, and decorate the men, so while they bake, the children can go out to play in the snow. Then, when they come in, they can warm up with cookies, and hot chocolate. Today though, the snow, while falling steadily, was building up very slowly, and it started late in the afternoon. So, we made the cookies, to enjoy for a story time snack tonight, instead. I usually kick off a gingerbread man unit study, with the first snow. And, I do have a number of gingerbread man, themed books standing by. 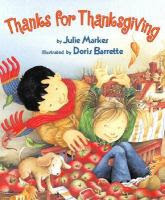 But, for tonight, we'll stick with one last Thanksgiving story - Thanks for Thanksgiving by Julie Markes. Markes, with the aid of Doris Barrettes' Mary Engelbreitish illustrations, transforms everyday happenings at home, at school, and around the playground, into warm, and praiseworthy events. And thanks to a quick mention of fun in the snow, and a plate of gingerbread men, pictured on the Thanksgiving table, it's a perfect match for our day. We always make cookies on the first snow, too! That is a great idea, but we probably won't get any for at least a month. I really love the book "Thanks for Thanksgiving"...it's my favorite Thanksgiving picture book actually! I wrote a short post about it on our blog (http://thegettys.blogspot.com) just the other day. Sounds so cozy and wonderful! I can't believe it's already time for hot chocolate and gingerbread men! I love your traditions. I'm going to have to "borrow" this one. Do you have a favorite gingerbread cookie recipe? That book looks cute. We haven't read it. I told you your snow was on its way! Those cookies look to cute to eat.